My husband received a pair of slippers for Father's Day from the kids because his old pair were nearly trotting themselves off to the rubbish bin - too many holes even for ventilation purposes! But we also made him a present that was just for him - three silhouette pictures of the kids. Brooke at Inchmark has made beautiful silhouettes in many different forms and her instructions are clear to follow and inspiring. I took an individual, profile photo of the kids - not easy when the two-year-old wants to wriggle and look in every other direction! 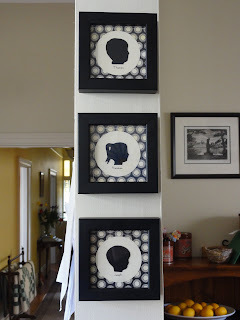 I printed the photos, cut around the heads, then traced them onto black cardboard, cut them out and framed them. Lots of wonderful Dads in these picture books. Dads who build cubby houses, carry small boys on their shoulders to provide a different viewpoint of the world, look for lost toys, care for injured birds, realise the importance of bedtime kisses, put up with grumpy behaviour ... The wonderful character of Dads represented in these picture books, just as in real life, are far more unique and individual than a pair of slippers! These prints of the children look amazing Karen. What a great idea! Thanks, Leane. Wait till you see what I have planned with your paper doll book!